My husband who is very quiet asked an interesting question at lunch yesterday. He said, "If you could go back and do an activity that you did in your past, what would it be?" For me-the answer was to be with my father who died when I was five. Just to see his face, hear his voice and feel his love for me. It didn't matter what we did, just to be together. 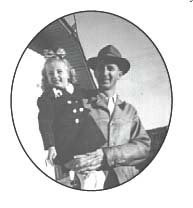 (Photo of my dad and me in 1943.) For my husband-it was to be fishing with his dad. Interesting how both of our activities revolved around our dads. Then a few minutes later, my son Dan called and his son Nathan wanted to talk to grandma-me. So we talked for a few minutes and then he wanted to talk to grandpa-my husband. So they had a cute conversation about Christmas. Even though my husband is a step grandpa, my grandchildren accept him fully. Seems to me having a dad or grandpa is very important to all our lives. Though they are all different-some more outgoing than others, we do need them. What would you do if you could go back and do an activity that you did in your past? Leave us a comment. I miss the horseback rides my family took when I was an adolescent. Maybe because my own father passed away in May of last year, and it's coming to the holidays, that I am thinking of him. He was always the one who took care of the horses, and was happy to help with saddling or even going along for a ride. It has been many years since we had enough horses for a family ride, and we don't have any now, but it would sure be nice to be able to do it again. I would go back to the little town in the Michigan UP that my mother was from; back to the time before her old house was torn down. Cross country skiing through the Toronto zoo. We did it every winter until I couldn't do it anymore. I loved the quiet with just the noise of the skis...my husband smiling..and me being able to do that. I would love that again.. Thank you Lin for all interesting and uplifting thoughts! I am so thankful I know English enough to understand what you say! I too have many experiences with my father that I would like to re-live. For instance when he, my sister and I biked around Skane with stops at 4 places, where we slept in a tent. My sister was 10 and I was 14. We had all the things we needed, inclusive the tent and sleeping bags, on our bikes. My mother had a Summer job, cleaning a school, so it was just the three of us that Summer. I also would like to experience again what you and I did when we travelled to Stockholm in 1992. As Bo and I are living at the Guesthome by the Temple right now, the memories go back to our trip and our conversations. Remember how we made associations while we were travelling on the roads? We had big decisions to make, both you and I, and to have a friend in that situation is gold worth. I am so grateful that you were there when I needed you, and that you have always been there for me. We never gave advise, as I remember, but we listened to each other. You are a very dear friend of mine! I would love to take a Sunday evening stroll down the railroad tracks with my dad the way we did when I was growing up. I'd sit at the kitchen table with my mom and decorate Santa Cookies with her one more time. I'd do her hair, andtake her out for some Mexican food. We'd sing at the top of our lungs together and go shopping for little trinkets to give to the children at the home where she volunteered. Later that day, I'd walk up the street and watch the high school football game huddled under a blanket with my dad. We'd come home with frozen toes and sip hot cocoa with lots of marshmallows and nibble on mom's peanut or lemon cookies. In the morning we'd take out daddy's boat and dive for sponges in the clear waters of Catalina Island. Or... I'd fly kites and run through the sprinklers with my children. We'd listen to Wayne spin his tall tales of "Uncle Zedekiah while making smores around the campfire. I'd braid my grandmother's hair and ask her to tell me about her life when she was growing up. I'd try oh her shoes and stumble around her house in them while parading in one of her dresses and hats. I'd hide under her old pepper tree and go to my grandpa's workshop to sweep up the sawdust from his latest project and he'd reward me by stuffing some rags that grandma had stiched and we'd make dolls out of them. This question just opened a flood of sweet memories. Thank you! I would go to my grandparents house. I loved that little house in Gatesville. I loved going there as a family and eating bacon for breakfast and having Granddaddy tell me the Little Red Riding Hood story, motor scooter and all.